Planning on selling your home in Greater Houston? You’re probably feeling a little nervous, which is normal especially if you’ve never done this before.While there’s no denying the fact that a home sale is rarely ever just a walk in the park, it doesn’t have to be an obstacle course either – a little planning goes a long way. Read on for tips on how to successfully navigate the process. Maybe you have a job waiting for you and you need to relocate as soon as possible. Or you just want to move up or down and you’re in no particular hurry. You need to come up with a calendar so you can get a clear idea about where in the process you’ll need to be at a particular date. This will also inform your marketing strategy – if you have a tight schedule, for example, then you’re going to need to speed things up right from the get-go. Do you have an existing mortgage? How much is the outstanding amount?Is there a pre-payment penalty? These are questions you want to know the answers to as early in the process as possible, especially if you’re planning on buying a home at the same time as well.Also, bear in mind that while the goal of a home sale is to put money in your pocket, you will need to spend a bit first before that can happen. You can’t set a budget unless you know where you stand financially. Once you’ve decided to sell your home, talk to your lender and refresh yourself on the particulars of your current mortgage. It’s also best to consult with your tax professional to find out what the tax implications of your home sale will be. Remember to include the cost of improvements and inspections in your budget. These can add up, especially if it turns out that you’re going to need to get a major repair done or anything like that. You should factor these in your calculations. Moving? Get an estimate of how much it will probably cost. Whether you’re relocating just across town or across the country, you’re probably going to need help from professional movers, etc. Don’t forget to set aside a budget for this early on. You’re going to be entrusting your agent with what is probably the most important piece of property you own. You will want to make sure that you’re putting that trust in the right person. Vet your agent as carefully and as thoroughly as you would anyone you plan on doing business with. Choose local. Because real estate is local. Look for agents who specialize in your neighborhood and ask them about their past sales in the area and about the kinds of properties they’ve sold. Look at the right numbers. Assessing an agent based on the list price they quote you or the size of their commission is not the best way to go about determining whether or not they will be able to look out for your interests. Consider instead their experience and track record – find out how long they’ve been in the industry, what their listings’ average list-to-sales price ratio is as well as the average days on market. Get personal. Recommendations from trusted friends and family members are invaluable. Ask the agents you’re interviewing if they can provide references from past clients as well. The price of recently sold comparable homes in your particular neighborhood. This is probably the biggest factor and your agent should be able to help you figure this out. In fact, most agents will offer you a comparative market analysis (CMA) for free. Your home’s location. Even within one neighborhood, the value of one house can be different from another’s even if they have comparable styles, sizes and features. One that’s in a cul-de-sac may be deemed more attractive, for example, and can fetch a higher price, or one house can be zoned to a different school district, etc. The temperature of the market. Is it cold, hot or just lukewarm? Market conditions can affect property values somewhat, especially if there’s a significant number of buyers and only a few months of inventory and vice versa. Once you have an idea of the prices in your area as well as what the current market trends are, you’ll be better equipped to make a decision about how much you should be asking for your home. Setting the right price is quite possibly the most crucial step in a home sale. It’s important to get it right from the beginning because it’s during those first few weeks of your home’s being on the market that it will garner the most attention. Set your emotions aside. It won’t be easy, but it’s necessary. You need to look at your house from an investor’s perspective so you can make better, smarter decisions. How do you come up with a price that’s “just right”? This is where your agent comes in. They will analyze all the data available and suggest a price that makes sense in current market conditions – this includes the list prices and sale prices of comparable homes in your vicinity, information about listings that have expired or been withdrawn, active listings, the days on market, and so on. First impressions are everything. Buyers are going to be deciding whether or not they like your house within the first few seconds – you will want to make sure that they like what they see. Get a home inspection done. This is something that buyers have to do during escrow, but you don’t want to wait until that late date to find out whether or not your house needs major repairs; it could bollix up the sale. Getting your home inspected before putting it on the market gives you time to deal with whatever issues are there. Not all improvements are going to add value. Ask your agent about those that will. You may not be able to recoup your investment if it turns out that buyers don’t really want to pay extra for the upgrades you put in. It’s best to make sure that whatever improvements you make will still be in line with what the rest of the neighborhood has to offer. Small upgrades can make a big difference. As can cleaning and de-cluttering. Sometimes the only things you have to do is to get a fresh coat of paint on, rearrange the furniture, or be more judicious with the pruning. Consider staging. This doesn’t have to be an all-out extravaganza; it’s all about creating an atmosphere of warmth and welcome. Also, you will want to make sure that your home doesn’t just look good – it should smell good as well. A good marketing strategy is one that’s comprehensive, but also targeted at the same time. Your home should be advertised on all relevant platforms and brought to the attention of the right buyers. Great photos are a must. Most buyers search for homes on the internet and often use their mobile devices to do so – they will want to see good, clear and well-lit images of your home. Buyers are online. Your home should be listed on the most-used real estate websites such as Realtor.com and HAR.com. The listing should contain as much information as possible. Don’t ignore other platforms. We often like to say that marketing a home means more than just sticking a for sale sign in the yard – that doesn’t mean you shouldn’t stick that sign in though! This and other more traditional marketing avenues such as ads in print publications can still be effective. Your agent will be able to advise you on the ones that are worth pursuing. If you’ve gotten multiple offers, good for you. Be prepared to negotiate – and endeavor to keep a cool head throughout. Your agent is required to show you all offers, even those that you’d consider laughably low, and you can reject, counter or accept an offer. Expect to compromise somewhat and know that it’s not always the price that both parties have some trouble agreeing on. There are other considerations such as the closing date, the specifics of what’s included in the sale, the earnest money deposit, and so on. 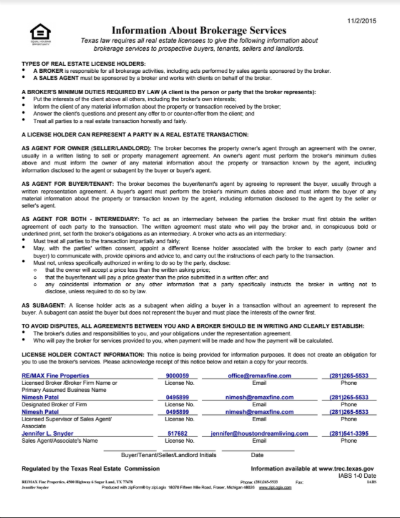 Provide a disclosure of the condition of your property. This includes an itemized list of appliances and features and whether or not they’re in good working condition, etc. You will also need to disclose certain conditions such as whether or not the property got flooded previously, if there have been previous fires, and so on. Make your home available for inspection. The buyer will need to have a home inspector look over your property and you’ll want to get this done as soon as possible. Clear contingencies. These usually have to be completed within a specific period, so make sure to schedule them accordingly. This is when you sign the papers transferring ownership of your property to the buyer and when the funds will in turn be released to you. Note that the buyer’s lender may sometimes take anything from a few hours to a few days before they release the funds to the title company. Also note that payments brought to the closing which exceed $1,500 need to be electronically wired or in the form of a certified check or a cashier’s check.